So it’s probably a high chance that you’ve received or are receiving a large number of automatic form submission to your site from your contact or enquiry forms. Nothing new here, we’ve all seen it. Gravity forms have some nifty settings to help get around these spam emails, like turning on the ‘honey pot’ feature in the Gravity Forms setting page. However, there’s another barrier or simple line of defence you can easily put in place to help beef up your spam avoidance. These questions are very easy to answer, and once done so, the form will let you submit. Turns out bots are not that great at simple math or mundane questions about the weather. It’s pretty simple actually. First, head over to your specific form and head into the form editor view. 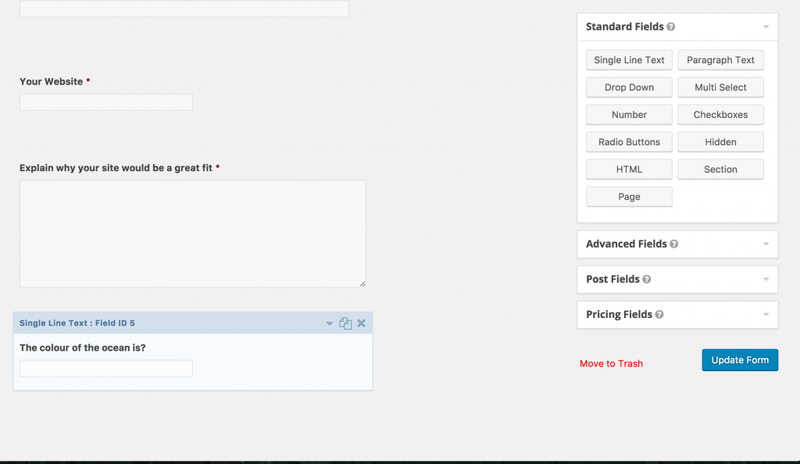 Next, add a new text field to the bottom of your form, and enter in your simple question as the field label. Save your form and head over to the ‘Form Settings‘ page. 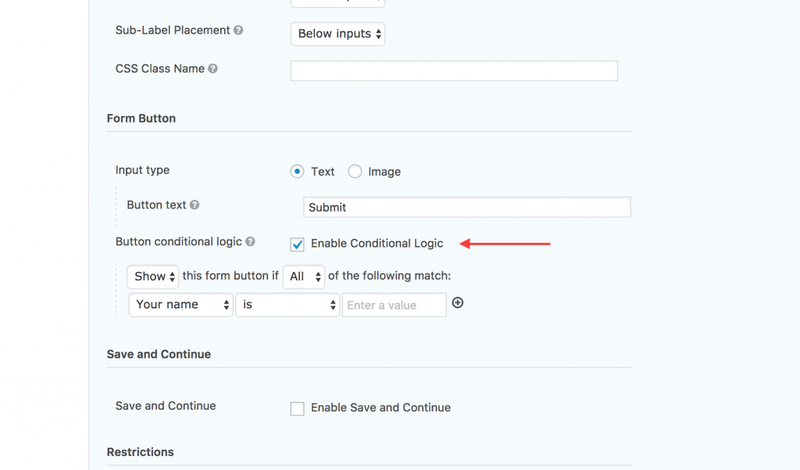 Scroll down to the ‘Form Button‘ section and tick on the ‘Enable Conditional Logic‘ tick box. Now’s the actual ‘smarts‘ of the process. 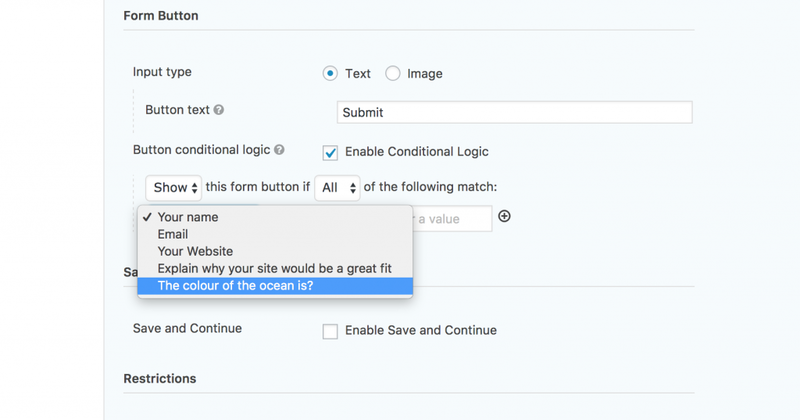 Basically, all we need to do is set up the conditional logic for the ‘Submit‘ button to only show, if our validation question field (‘The colour of the ocean is?‘) has a correct value entered into it. 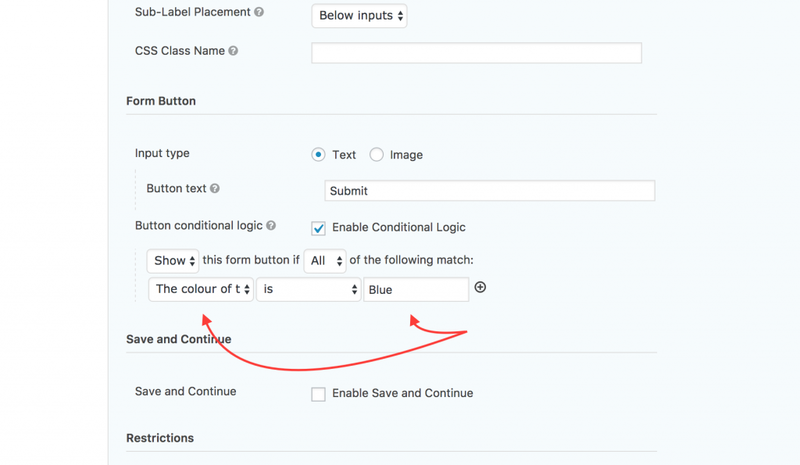 For example, if a user enters ‘Blue‘ into the validation field, the submit button will show, if they enter red, or an incorrect answer, the submit button will not show. This basically ensures that the submit button, only displays if the correct answer is entered into our human validation form. So, pretty easy huh! The submit button only shows up now if you enter the correct answer into our human validation field! Here’s a bunch of question and answers I’ve quickly come up with that you may want to use or at least get you started. Q The colour fo the ocean is? Q 20 + 20 equals? Q A cow has how many legs? Q There is how many days in a week? Give it a try and let us know how you go! Are there any other cool tricks or login you personally engaging for your forms? We’d love to hear them.